When I was growing up, I had little use for history. It was the people and beautiful, sometimes haunting, historic places of Delaware that changed that. It started in 1962 with some intriguing tales told by a friend of the family about sunken pirate ships just offshore that tease beachgoers with bits and pieces of treasure tossed up on our shores after bad storms. Later came my husband's and brother-in-law's probably somewhat tall tales of exploits in Milford's then-deserted Parson Thorne Mansion and its reputed hidden passages to a graveyard -- once part of the underground railroad during the Civil War. Years later, for one weekend in the 1970s, I had possession of the keys to the then-desolate Gov. William Henry Ross Mansion in Seaford as I contemplated renting it. Later still, I was fortunate to be among the founding members of the Delaware Seashore Preservation charged with the restoration of the U.S. Life-Saving Station at Indian River Inlet. There's something about seeing and touching that makes history real, puts it in a present tense. You can't help but wonder when you walk on the grounds of a building that has been in existence more than 100 years what has transpired in that place. Fenwick Island Lighthouse first shined its protective beacon across the Atlantic, warning navigators away from the treacherous Fenwick Shoals just offshore, on August 1, 1859, after more than a century of political wrangling over boundaries. There is a large white carved stone marker dated 1751 that bears the arms of Lord Baltimore on the south side and William Penn on the north. It is the first stone set up in connection with the Mason and Dixon line survey, and it is the only remaining of a series of stones laid every five miles to mark the line between what is now Delaware and Maryland and the division between north and south during the Civil War. Congress authorized the erection of a lighthouse on the barrier island of Fenwick, Delaware's most southern coastal town, in 1856. By 1857, the site for the lighthouse had been selected and marked and the tower was completed early in 1859. The total cost was $23,748.96. In 1932, a strip of land 60 ft. wide, extending east and west across the site, was deeded to the State of Delaware for roadway purposes (Rt. 54), and in 1940, about three-fourths of the site was sold, including the northern wooded half and 2.71 acres of the southern half - land former lighthouse keepers and their families once hunted and farmed. The tower is 83 feet above water and the top of the lantern 87 feet above ground. A 25,000-candlepower Fresnel light flashes white every 3 seconds and is visible 15 miles out to sea. Fenwick Lighthouse is still in operation, thanks to Friends of the Fenwick Island Lighthouse and the State of Delaware. My painting shows this stalwart structure in a way I have always wanted to see it. No trailer parks, signs telephone poles, just nature, the way it looked when builders finished it - a symbol of man's ingenuity and love for fellow man by day, a beacon by night. I've often wondered what it would be like to wander the beach and see the lighthouse back then. Several years ago, a woman came into my gallery who allowed me to do just that -- in imagination - by bringing me a rare photograph taken of the lighthouse in 1891, just 32 years after it was built. For a few months, I mentally walked those grounds, the dunes, with my pastels, guided by details not evident in the photos and tales this elderly but quite spunky lighthouse keeper's granddaughter told. The lighthouse has never been moved, contrary to what people think when they see my painting. The land has moved. Fenwick is a shifting barrier island and many changes have occurred since the lighthouse was built. To duplicate the exact photographic angle of the old photo would require not just a boat, but most likely also a jack hammer. I believe you'd have to tear out at least the western exterior wall of the Candy Kitchen building on Coastal Highway, possibly more, to get to the same spot where that old photo was taken - at that time from the water. From walking the area, photographing and studying the grounds, I believe that the area where Candy Kitchen and Coastal Highway are today were in the ocean in 1891. What a beautiful view that must have been. 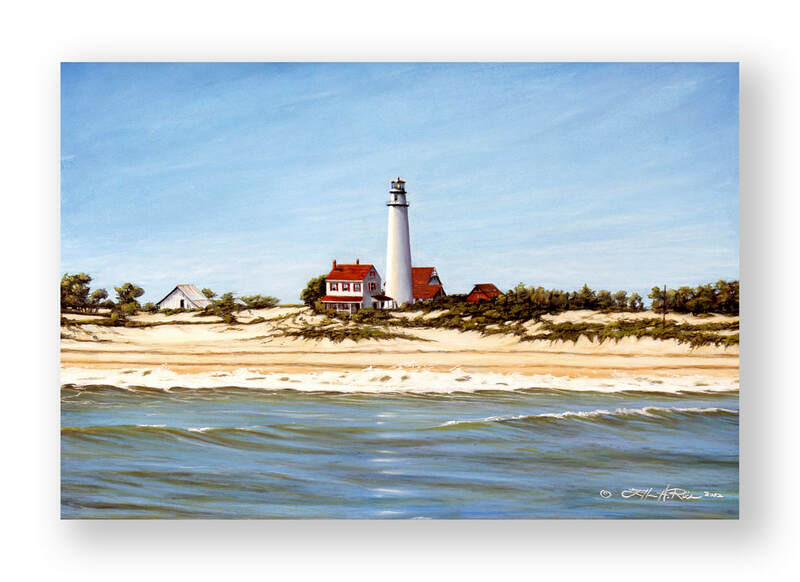 I've tried to recreate it in my pastel window through time, "Fenwick Island Lighthouse - 1891." I hope you enjoy it.